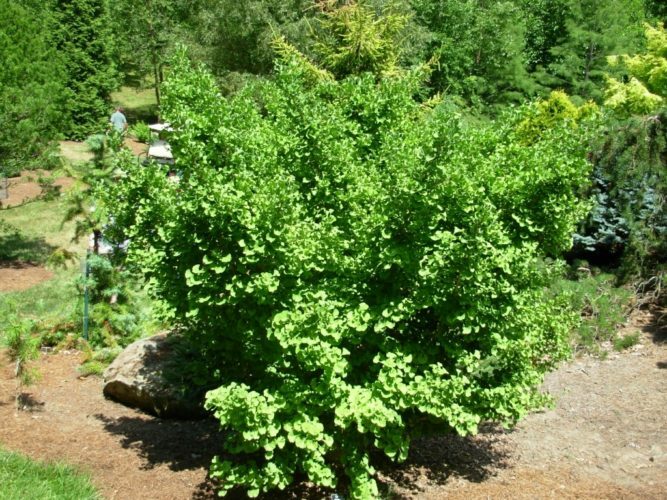 Ginkgo biloba 'Mariken' is a compact, dwarf, semi-pendulous selection of Maidenhair tree that's exceptional when grafted high on its understock. 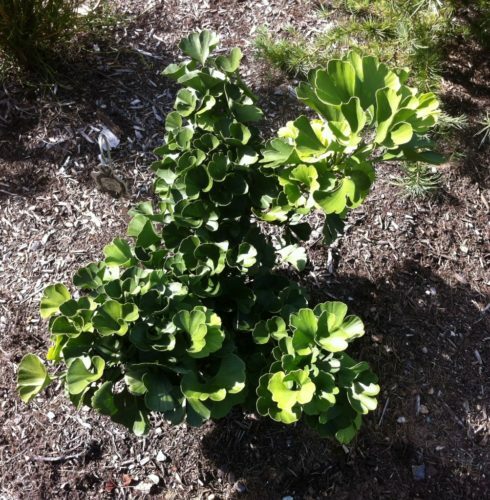 This male clone has thick young branchlets that are densely packed with succulent green leaves. After 10 years, a mature plant will become a flattened globe, 20 to 24 inches (50 - 60 cm) wide and half as tall, suggesting an annual growth rate of 2 inches (5 cm). This cultivar originated as witch's broom found in 1995 by Piet Vergeldt in Kronenburger Park, Nijmegen, The Netherlands. This plant was one of three selected in 2010 for the ACS Conifers Collector of the Year program. Ginkgo biloba 'Mariken,' the Collectors Conifer of the Year for 2010, Brunswick, Maine, 2013. Ginkgo biloba 'Mariken' at Mission Oaks Garden, Zanesville, Ohio. Photo taken during the ACS National Meeting, June 25, 2016.